We offer a range of lead attachment services based on our proprietary process, developed to maintain the integrity of component-to-PCB solder joints under stress. Poor compliance, extreme vibration and thermal expansion can cause these joints to crack. 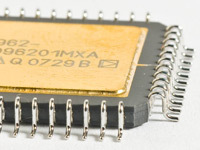 We use high-compliance leads that protect the solder interface by allowing the component to flex. Our timely and cost-effective lead attach services have been used to successfully replace and reform leads on components for high reliability applications including helicopters, missiles and satellites. During the past several decades, we have attached leads to hundreds of thousands of devices using our post-assembly high-temperature lead-attachment process, with virtually no performance problems with components after board-mounting. For tin-lead soldering, we use high-liquid-temperature 5Sn-95Pb solder alloy to prevent solder reflow of leaded packages as they undergo further processing. This method of lead attachment often exceeds the stringent lead-integrity requirements of MIL-STD-883, without impacting the electrical characteristics of the packaged device. Our round-lead gullwing chip carriers meet MIL-M-38510 and MIL-STD-883 requirements, while providing the compliance between the ceramic chip carrier and the printed wiring board.